Illustration by Joyce Chan. © Verywell, 2017. You each have your own story of how MS has weaved its way into your or your loved one's life and how that has affected your relationships, beliefs, and well-being. Multiple sclerosis also has its own story too—one that is as convoluted as the symptoms it causes and the chaos it often inflicts on our lives. By sharing the story of multiple sclerosis, you can hopefully gain insight into just how far we have come in understanding this complex disease—especially in the last 20 years—and even give you a glimmer of hope for what may be to come. One of the first written reports of multiple sclerosis was detailed in the Vatican archives in the 14th century. In the archives, the symptoms of Saint Ludwina of Schiedam were described after she experienced a fall from skating at the age of 16. She recovered partially from the fall but continued to have episodes of leg weakness, vision problems, and loss of balance. Interestingly, her parish priest suggested that this illness came from God, so Saint Ludwina made it her mission to endure the symptoms for the sake of others. About 300 years later, descriptions suggestive of MS were found in the diary of Sir Augustus Frederick d'Este, the grandson of King George III of England. He wrote about a relapsing-remitting disease course in which he experienced bouts of neurological dysfunction like vision problems (believed to be optic neuritis), double vision, leg weakness, and bowel and bladder problems. He then described a more progressive disease course, which eventually left him bed-bound until his death in 1848 at the age of 54. In 1824, the first modern clinical description of MS was reported by Dr. Charles-Prosper Ollivier d'Angers. In his written work, he described a 17-year-old boy who experienced episodes of walking and bladder problems that were worsened by exposure to a hot spa—now known as the Uhthoff phenomenon. In 1868, Jean-Martin Charcot, a neurologist from Paris, studied a young woman with tremors, slurred speech, and abnormal eye movements (called nystagmus). When this woman died, he examined her brain at the autopsy and described the "plaques" of multiple sclerosis, also known as scars or lesions. Then, in a series of lectures, Charcot defined and described multiple sclerosis and the science behind it—how the myelin that surrounds nerve fibers is damaged. Still, though, he was perplexed by the "why" behind MS or how to treat it. We now know that the immune system is the culprit behind myelin damage in MS. However, at the time of Charcot, people did not know MS was an immune-mediated disease or that the immune system even existed. MS is more common in women than men. MS is a variable disease (meaning people with MS have unique symptoms). The environment (in addition to genes) plays a role in whether or not a person develops MS.
MS is more common in people who live at northern latitudes. The lack of effective MS therapies only seemed to motivate scientists and research on MS continued to evolve. Then the Association for Research in Nervous and Mental Diseases (ARNMD) formed in 1921, allowing ideas and research on MS to be compiled and consolidated from the last 50 years. A big discovery occurred in 1935 when Dr. Thomas Rivers in New York City found an animal model of MS, called experimental autoimmune encephalomyelitis (EAE). He did this by vaccinating animals with healthy myelin and then producing an immune system attack on the animal's own myelin. The EAE model is now a major cornerstone in MS research. In fact, treatments are first tested in EAE before being tested in humans. This animal model also eventually prompted the notion that MS is an immune-mediated disease—although this connection would not be forged until the 1950s. In 1945, a woman named Sylvia Lawry placed an advertisement in the New York Times (her brother Benjamin had MS) stating "Multiple sclerosis: will anyone who has recovered from it please communicate with patient." A large number of replies inspired her to start an organization of 11 neurology leaders and other advocates and friends, called the National MS Society. Lawry's work paired with the National MS Society then sparked the formation of the National Institute of Neurological Disorders and Stroke in 1950. Still, at this time, MS treatments were not studied scientifically, meaning they were derived from opinion and not data from studies. For instance, many experts at the time believed that MS stemmed from a blood vessel problem, so people with MS were treated with blood thinners. Results revealed that the group who received ACTH versus those who received a placebo had a faster recovery from their MS attacks. This study was paramount in revealing that steroids could reduce the inflammation of an MS relapse. That being said, steroids do not slow down the progression of MS. Imaging tools soon developed that allowed doctors to better visualize MS disease activity. These included the first CAT scans in the late 1970s, followed by evoked potentials, and, finally, MRIs used for the first time in the early 1980s to visualize the brain of a person with MS. MRI technology has continued to evolve immensely and has revolutionized both the diagnosis of MS and determining how well a person is responding to treatment. The first disease-modifying injectable medication, called Betaseron (interferon beta-1b), was approved in 1993. It was followed by Avonex (interferon beta-1a), Rebif (interferon beta-1a), and Copaxone (glatiramer acetate). In 2006, the first infused therapy was approved for MS called Tysabri (natalizumab). In 2010, the first oral MS medication was approved, called Gilenya (fingolimod), which provided an option for people who could not tolerate medications that needed to be injected or for people whose MS continued to worsen despite interferon therapy. This was followed by the approval of two more oral medications, Aubagio (teriflunomide) in 2012 and Tecfidera (dimethyl fumarate) in 2013. In 2014, another infused disease-modifying medication called Lemtrada (alemtuzumab) was approved for people who had an inadequate response to two or more other disease-modifying therapies. In 2016, Zinbryta (daclizumab), another injectable medication was approved. In 2017, Ocrevus (ocrelizumab) was approved to treat not only relapsing forms of MS but also primary progressive MS—the first MS therapy to do this, which is encouraging. The future of MS is bright, as experts continue to fine-tune their knowledge and broaden their research ideas. One huge area of research currently occurring is the study of myelin repair. While therapies in the last 40 years have targeted the immune system and how myelin damage can be prevented, experts are now looking into how the brain can restore myelin once it has been damaged—a truly novel perspective on healing. Other exciting research prospects include the role of diet, gut bacteria, vitamin D, and genetic mutations in MS. Also being considered is how complementary therapies, like yoga, can help a person manage their symptoms better. Finally, experts have discovered ways to help people with MS live more comfortably. From rehabilitation therapies that help people strengthen muscle tone after a relapse to exercise programs that help people combat MS-related fatigue, many people with MS and their loved ones are able to live well with this disease—a remarkable accomplishment on its own. The story of MS will continue, as the twisty, curvy path of understanding this complex disease and all its nuances and mysteries is still ongoing. But the progress that has been made in the last 20 years is immense. And with that, there is hope—an optimism held by those who experience MS every day and who know that a cure will arrive one day, if not for us, than for those after us. Birnbaum, M.D. George. 2013. Multiple Sclerosis: Clinician’s Guide to Diagnosis and Treatment, 2nd Edition. New York, New York. Oxford University Press. Murray TJ. The history of multiple sclerosis: the changing frame of the disease over the centuries. J Neurol Sci. 2009 Feb 1;277 Suppl 1:S3-8. National MS Society. 2016. Disease-Modifying Therapies for MS.
Rolak LA. 2016. 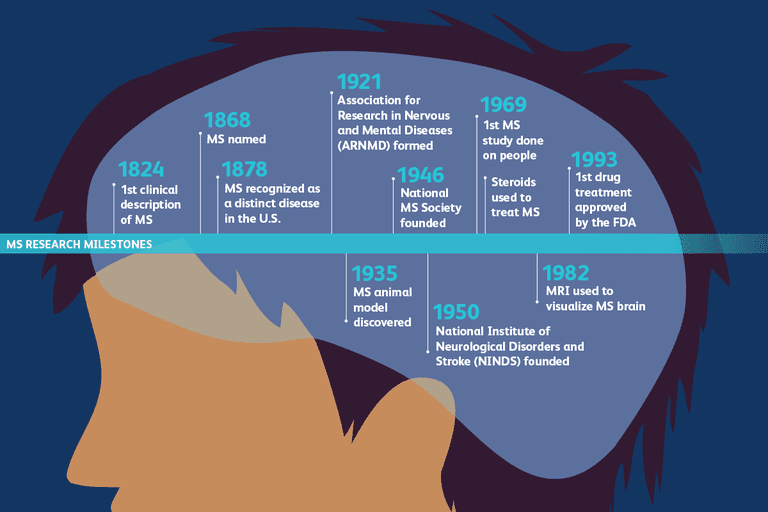 National MS Society: The History of MS: The Basic Facts. Rolak LA. MS: The Basic Facts. Clin Med Res. 2003;1(1):61-62.